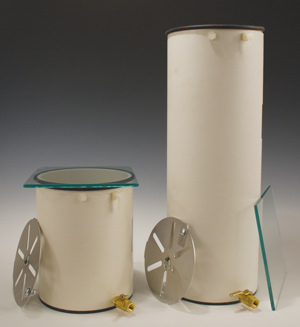 The heart of the System is the 6" diameter PVC Vacuum Chamber. It is fitted with O-ring seal that supports an ultra high strength tempered glass plate. The chamber includes a cam-lock anti-float plate to keep the pieces submerged. The chamber has a hose barb on the side for 3/8" ID hose. Each chamber includes a drain valve to make emptying easy. Each chamber has a plugged hole ready to accept the drain tube from the Vacuum Bags or an optional pressure gauge (not needed if using vac generator). There are two lengths of chamber available, 8" or 18". The 8" will hold 20-35 pen blanks, and is also good for stopper blanks and will hold pieces up to about 7" long. The 18" is good for peppermill blanks and longer pieces up to 17" long. We offer dyes that are used to color the stabilizing resin to achieve striking results. The Vacuum Generator (purchased separately) uses an air compressor to create a vacuum. It works with a compressor that has at least 2.5 CFM. The generator includes: on/off switch, vacuum gauge, regulator to adjust vacuum. The generator uses 70-90 PSI to create up to 24" of vacuum. The vacuum can be provided by the the Hold Fast Vacuum Generator used with a compressor or by a Vacuum Pump. If using a vacuum pump, if you need a gauge and a way to reduce the vacuum we offer a Vacuum Control Valve as an option below.